In last week’s preview covering the October 27th release it was John who wrote about the “Premium Parade.” John has reminded us all, as did David in his previous report for October 13th that VINTAGES likes to roll out the big guns in the two months leading up to the holiday season. What a shocker. I’m pleased to follow up on the theme with more than a few overflowing handfuls of high-end wines that settle with great weight and density into a more than similar ilk. It’s more than just a late October release that delivers gifts of such hedonistic and full character flavour. The Sonoma County Vintners came through town just last week with armfuls of the good stuff. There was a trade and media walk-around tasting in the afternoon of the 16th followed by a VINTAGES supported consumer affair in the evening. Thirty-three producers showcased 75 wines and it is safe to say that Sonoma knows how to put on a show. 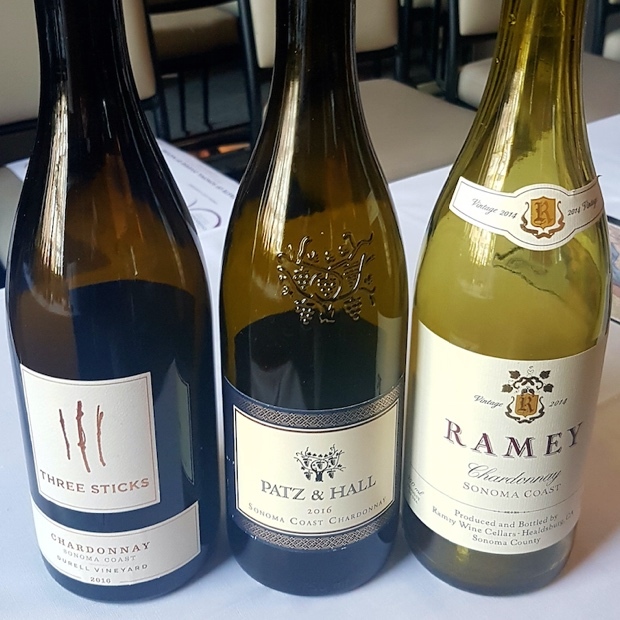 What piqued my interest the most was a Masterclass/Tutored Tasting titled “Diverse by Nature” and hosted by none other than WineAlign’s John Szabo. My notes on the wines poured are featured just below. All of the 75 wines continue to be available for purchase on the VINTAGES Shop Online site. The VINTAGES opinion is one that states “Sonoma County is predominantly family farmers who produce some of the world’s best grapes and wine and have done so for generations. It’s also the first wine region in the US to commit to becoming 100% sustainable by 2019.” They noted that the event features “a bounty of stellar Pinot Noirs, full-bodied Cabernets, stylish Chardonnays and spicy Zinfandels – most with 90+ scores.” This is nothing but truth. I scored all 10 wines I tasted at the Sonoma seminar at 90-plus. So what is so special about Sonoma County? First look at its size. With approximately 75,000 planted acres only Bordeaux is bigger (much bigger) and Sonoma easily outgrows Napa Valley, New Zealand, Bourgogne and the Okanagan Valley. Nearly 500 wineries grow a multitude of varieties but there is some definitive concentration and specialization. In terms of hectares chardonnay is king, at 6,500 while pinot noir and cabernet sauvignon follow closely at roughly 5,400 each. The next four most planted grape varieties are zinfandel, merlot, sauvignon blanc and syrah. Five distinct soils make up the multifarious terroir of Sonoma; Francisco Complex covers nearly half of the west and northern territories. Then we find Salinia, Glen Ellen Formation, Sonoma Volcanics and Wilson Grove Formation. The coolest spots and perfect for chardonnay are Green Valley and Carneros while it is the pinot noir appellations of Fort Ross-Seaview, Sonoma Coast and Russian River Valley that bridge the gap to a moderate climate. In that mid-temperature category we see the merlot high ground of Chalk Hill and Bennet Valley. Both chardonnay and cabernet sauvignon work well in the moderate to quite warm spots of Sonoma Mountain and Sonoma Valley. Slightly warmer are the zinfandel hot spots of Rockpile and Dry Creek Valley. The warmest areas that are best suited to cabernet sauvignon are Alexander Valley, Fountaingrove, Knights Valley and Pine Mountain-Cloverdale Park. Let us not forget the rest of the Sonoma County AVAs, Moon Mountain, Northern Sonoma and Petaluma Gap. Most important these days is what’s found inside and within these distinct regional territories. In Sonoma they like to call them “neighbourhoods,” micro-climates like Middle Ranch and Laguna Ridge in the Russian River Valley. These are akin to the Villages of Bourgogne so consumers can now begin to seek out varietal specificities with which to align from these hoods. Don’t look for a singular regional-varietal character, but rather look at the towns, a.k.a in that Bourgogne sense of the ideal, the Villages. Look back to 1857, to the story of the Buena Vista Count, collector of European grapevines (mainly in Vienna) brought back to California. This got everything started, including the Croatian variety zinfandel which at the time was being cultivated as part of the Austro-Hungarian empire. Look at the transfer from bulk to premium wine in the 1970s and the infamous moment at the Judgement of Paris when Chateau Montelena was the shocking victorious wine. John mentioned last week that the main VINTAGES theme for October 27th is in fact Italy and not California and so David and I offer up some critics’ love for the great wines of that vast producing country. We take you to Umbria, Veneto, Toscana (including Chianti Classico) and Piemonte for some stellar choices. We wrap up the selections with some miscellaneous wines from around the globe, including some homegrown picks just a jog down the QEW and onto the Niagara Peninsula. Michael Godel – From the confluence of three appellations, coast, valley and mountain, not to mention a combination of rock and soil in ratios that as assets determine influence. Buttery and if aromas were textured this would be viscous, licked up from the thickness of fog filling in the mid-palate. Notable is that here the change in Sonoma styles over the past decade is arriving at this gate of transparency. Sharper now and gummed by less glück is the simplest way to sum it all up. Expressive in the ways of varietal and place is the bigger picture summarized. Michael Godel – Much more direct, sharp, pinpointed and poignant for modern day chardonnay, with ripe orchard park flavours, high acidity and great internalized impression. Five vineyards get together in this perfectly tidy house conglomerate and added up the stylistic is expressly P & H. From many famous Sonoma vineyards sometimes, often but not always inclusive of Sanchietti, Parmalee Hill, Pleasant Hill, Gap’s Crown, Dutton Ranch and Durell. A necessary parts when integrated are counted as contributors to the whole. Michael Godel – Wild ferment and thrown in to bottle, literally. From Goldridge, those parochial, sought after soils, composed by 70 per cent Martinelli Charles Ranch and (30) Platt Vineyard. Rich without weight, texture without acting overly creamy. A beautifully balanced wine. Michael Godel – Just west of the winery is the flat topography characterized by compact clay soils of Parsons’ Vineyard on the Santa Rosa Plain. The 2015 pinot noir is one of high energy ripe fruit but also beautiful acids. This is the ripe pinot noir we’ve come to know from the last 20 years and occupying a chair at the hyperbole of thought and execution. Such a guarantee of what to expect from the Russian River Valley. Strawberry jam, cola and the artfully managed barrel dodger. Broad and velvety. Michael Godel – Broad, even riper, of real lush texture and a bit ferric. Tart, tight, intense with at the edge evolution, development and ripeness. This is the trimmer set to the finest setting, allowing some room for growth but also leaving behind a stylish, nearly clean to the skin style. Michael Godel – The organically and biodynamically farmed Olivet Ranch Vineyard estate block has been owned by Boisset Family Estates since 2003. In 2014 this is bigger, fuller, taller, riper and certainly imbued with more wood influence. This from the J.C. Boisset stable is almost a throwback to innocent and precocious times. While the acidity in this vintage carries the dark fruit to terrific heights, it really is impressive how this works the glass and the room. Michael Godel – Shows an extreme ripeness of being reaching to the breach and teetering on the edge while so successfully camping there. Dark fruit, nearly dusty and so filled in. Ripe, figgy and raisined with managed acidity to keep things in swimming balance. Berries of varying ripeness on old vines make for the great multi-juxtaposed connections. The 22 per cent petite sirah increases the curiosity, that plus three types of oak. So much going on and a good vintage for this OV zin. Michael Godel – From 1972 planted vines on Cortina soil and yet curiously not referred to as old vines. The high-toned dark fruit does in fact present a curious juxtaposition, ripe and hematic but also savoury, dusty and mineral. This is just around the corner from entering into the perfect window of its life, integrated and in delivery of its gravelly-loam origins. Only identifiable as Seghesio and always on point. Michael Godel – Take some time to allow Silver Oak’s cabernet to settle in and you might just smile a bit more. Here we are at that point, certainly glued to a house style, big in barrel with American influence and set up with Daniel Baron’s signature passed on through Nate Weis, most recent accomplice as Director of Winemaking. Pencil shavings and early harvested balance plus some wood waiting out of that wood means you are given some Alexander Valley grace at this stage of fine tannin development. Michael Godel – This is the “lay down in the third bed and it was just right” Rodney Strong cabernet sauvignon from half new French barrel and nicely integrated at this point. Here the darkness of fruit and tighter if rounder structure comes from mountain fruit. Dusty dark black with briny Mediterranean accents leads this down a spice route road. In a delicious spot right now with a finishing bite of very dark, high cocoa content chocolate. Michael Godel – Ancient Vines means some of the fruit was gained from bunches hanging with canes more than 100 years in age. It certainly brings some depth, concentration and structure to zinfandel at an entry-level price. It’s all about red fruit here, Contra Costa County style, with a sweet bramble and red liquorice accent. David Lawrason – Within the realm of California’s very pricy premium cabs, this one is a steal. It shows the classic lifted eucalyptus and cedar of this high altitude Sonoma site, with wonderfully pure red and blackcurrant fruit nicely settled amid the oak. Great aromatics here. It is full bodied, warm, generous and lively, yet structured at the same time, with classic graphite on the finish. Michael Godel – A little red volcanic soil goes a long way in the single-vineyard Jack London cabernet sauvignon from Sonoma Mountain. Great fruit and a calm before the storm make this what it is; ripe and savoury, juicy and sapid, tart and elastic. Still one of California’s great value cabernets with a true sense of history and purpose. Michael Godel – Persisting as one of the better values in Napa Valley cabernet sauvignon from a time-honoured respected house is this savoury number from Mount Veeder. Mountain fruit doles blackberry, chocolate and a tisane that makes this as complex as it is rich and deep. It’s a gift that this wine has lasted this long south of the $50 mark in the Ontario market. That’s surely set to change at any moment’s vintage. David Lawrason – The profile is more Bordeaux than Napa except for some fruit sweetness. Expect The nicely lifted and fragrant aromas of classic blackcurrant, rosemary, cedar and vaguely meaty notes, plus a sense of wet stone/cement. It is medium-full bodied, juicy and fresh, with firm acidity interesting sous-bois woodsiness and considerable tannin. The length is excellent to outstanding. Michael Godel – The combination of warm site and well-managed alcohol and acidity make for a Napa cabernet sauvignon of great savour and interest. This is the sort of texture you want if you come looking for honest clarity in Napa Valley fruit. It’s a Mediterranean dusty garrigue with meaty, olive and even briny notes. It keeps the notions of espresso and chocolate in check and at bay. As are the hints of laurel and the smouldering boughs and herbs. Really solid structure will take this deep into the next decade. Michael Godel – Zenato’s is just what the doctor ordered from and for Valpolicella. Takes the really ideal vintage, part 2015 generosity and part 2014 grip and turns it out expressly 2016. The fruit is full and pure for class and structure. Drink this now or wait on it. It depends on what you want. Fruit and freshness? Woven development and calm? Depende, depende. Michael Godel – The use of varietal cabernet sauvignon in this part of Tuscany is not as common as you might think and it should be noted that the land plays such a prominent earthy tone in this expatriate wine. It’s both entirely unique and coming along so nicely in its evolution. Fresh and dried fruit combine for a great leathery texture while high local acidity teases with volatile comedy and drama. Great food wine in the best general sense of the idea. David Lawrason – This is fairly pale garnet colour from the extended barrel ageing given to gran selezione. It has a nicely lifted, complex nose of cranberry redcurrant fruit, cedar, leather and spice – all nicely meshed. It is medium weight, elegant, warmish and spicy with mild tannin. Quite concentrated with excellent length. Best in another year or two. Michael Godel – The original Gran Selezione is the Ducale Oro, going back almost a decade now from this 2014 and that is almost hard to believe. Time flies and so here we are, from the challenge of a working person’s vintage where only the few survived. If I were to make a suggestion I’d say this ’14 Gran Selezione is not to be missed. It’s quite a beautiful effort, sweetly aromatic and with fine texture meeting finer acidity. It’s a very good Ruffino. David Lawrason – From high altitude vineyards in central Umbria, this is a powerful, complex chardonnay with very intense aromas of spice, honey, grilled pineapple, lemon, vanilla and a slightly reductive oniony note. It is full bodied, intense and firm with a warm finish. Quite smoky on the palate. The length is excellent to outstanding. Solid and very impressive. Michael Godel – Intensely reductive from warm 2016 it seems crystalline that Cervaro della Sala was purposely equipped with fortifying fresh assurance to balance out the richness of very ripe vintage fruit. Looking inward and beyond the cracked shell there is some creamy green apple purée and more than a shot or few of ripely developed chardonnay liqueur. It’s a big wine in a Sonoma vein, like Three Sticks or Chateau Montelena, albeit in traditional Umbrian clothing. Michael Godel – Marengo Cerretta is traditionally firm and really floral nebbiolo now settling in with a delicasse it was likely unaccounted for when much younger. The intense liqueur has rendered to a point of aiding and abetting the rose petal aromas while the tannins continue to munch away at the strength carried by the fruit. The structure here is quite impressive. Sara d’Amato – Named after the Grillese river that flows adjacent to the estate, Grillesino focus on vineyard techniques with minimal intervention from winemaking. A blend of sangiovese, cabernet sauvignon and ciliegiolo, this unfiltered red offers a pleasant tang and notable purity of fruit without significant wood treatment. Excellent value. 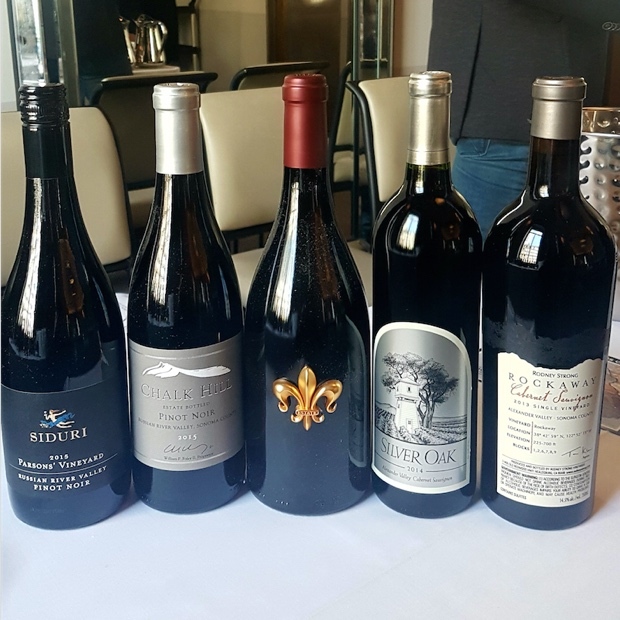 Michael Godel – Along with the Hemel-en-Aarde Valley it is Elgin that continues to prove itself as the Western Cape’s top source for pinot noir. Thomas Webb’s Thelema pinot noir helps to drive that important point. There’s a lovely red fruit purity and fine-grained tannin here that speaks to the ancient soils, the elevation and the proximate-aspect relationship to two oceans. It’s not a salty pinot but there is a dual marine influence that variegates the red fruit. Lovely drink ability here with a modest potential to age. David Lawrason – Drawing from the fruit and experience of great winemaking at Tawse, this delivers very good value in a slim yet creamy chardonnay that shows fine aromas of vanillin, nougat, baked apple and nutmeg. Nicely oaked. There is a fine slim, taut and mineral feel. The length is very good. Michael Godel – Very Twenty Mile Bench in the mature way that riesling doles out fruit, acids and balance. It’s both succulent and carefree but also confident and understandable. It’s the kind of riesling the most common and non-daring of drinkers will taste and say, “ that’s really good.” Ivan goes clean and simple. Well done Mr. Baker. Sara d’Amato – A spritely, vivacious verdejo with a lovely salty crunchiness and a mineral bite. Bright pear and sour apple brighten the palate while nervy acids add tension to the mid-weight profile. A touch of wildness adds intrigue to this energetic white that is as enjoyable for solo sipping as it is would be crunchy radishes atop a bed of lightly dressed greens. Sara d’Amato – Rich and meaty with floral and peppery overtones, this well-priced syrah has Chile written all over it. Not to ripe yet still mouthfilling with juicy black currant (not wood) dominating the palate. Lightly tacky tannins do not affect its inviting nature. A memorable class-act with impressive length. Sara d’Amato – Brunel’s roots are in Châteauneuf-du-Pape and the wines focus on subtlety and elegance using an organic approach. Of excellent value, this Côtes-du-Rhône blend offers voluminous flavours with a touch of the local scrub “garrigue” as well as a peppery character from syrah. Clean, expressive and effortlessly drinkable. Michael Godel – Stoller brings the Dundee Hills to you with this spritely unoaked chardonnay of great energy and presence. Winemaker Melissa Burr’s notion is expressly place driven and the chance of tasting terroir at this price is a rare an elusive one. Don’t miss this. It’s svelte and concise, precise and wastes not a single note. Hard to find this sort of quality, depth of flavour and focus in unwooded chardonnay anywhere not called Chablis. Michael Godel – As full, flavourful and generous of cool-climate chardonnay spirit as it has ever shown, the 2016 Estate work is pure, unbridled and effortless genius. What it exudes in energy is only eclipsed by a hidden grace and it serves as the exacting launch point for more specific and eccentric Hidden Bench offerings. Spend $10 more on Bench chardonnay like this and you’ll be drinking properly every time out. Michael Godel – What’s most amazing right now about winemaking in Argentina is this exploration of hyper-specific micro-terroirs, case in point Los Miradores by Luigi Bosca. Here is Villa Seca in Valle de Uco, equipped with three highly prized massal selection vines that when combined with this variegated stony terroir lead to, wait for it, malbec magic. The nose gives it away. It just smells like wet stones and crumbling earth. It’s amazing and uncanny.